The award recognises Anne’s leadership and impact within occupational health education and also her leadership in the development and delivery of interventions - including programmes/workshops incorporating HIV/AIDS awareness, and other public health initiatives in a remote rural area within Limpopo, South Africa. This work has also resulted in several people being able to secure employment following the completion of the workshops. Over the years Anne’s work has also inspired LSBU academic staff, graduates and practice teachers to get involved and contribute to the ground-breaking work she’s been doing in South Africa. This recognition builds on her earlier successes, including being awarded a National Teaching Fellowship by the Higher Education Academy and a Principal Fellowship. Additionally, she was shortlisted for the Nursing Times Nurse of the Year 2016. The FRCN is a measure of considerable esteem within the nursing profession as it’s the highest award the Royal College of Nursing can bestow, and very few people have received it. FRCN is conferred on those who have made an exceptional contribution to nursing or health care – whether through clinical innovation, leadership, and research or practice development. 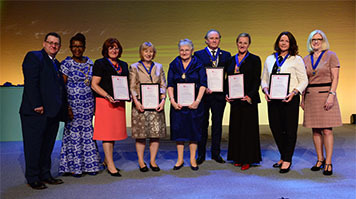 Speaking at the FRCN awards, RCN Chief Executive Janet Davies outlined the key areas of excellence that have triggered Anne Harriss’ Fellowship of Royal College of Nursing. “Anne is driving force for occupational health nursing in education, both in the UK and across Europe. “With almost 25 years’ experience as an educator she has been recognised by the occupational health journal as one of the top 14 leading lights in her specialism and the most significant educationalist. “For the last 15 years Anne has been using her holidays to do voluntary work in South Africa, playing a major role in improving the healthcare of an impoverished rural community where Aids is rife. “Receiving this Fellowship is the highest award the Royal College of Nursing (RCN) bestows. I am truly honoured to join the elite group of people who are leaders within the nursing profession. In the history of the RCN there have only ever been two other Occupational Health nurses who have achieved this recognition. “The news that Anne Harriss has been awarded Fellowship of the Royal College of Nursing is incredibly exciting. Find out more about the School of Health and Social Care.